In recent memorial pull force tests carried out on the NAMM accredited ground anchors, it has come to our notice that when a headstone tested or pushed from the back of the memorial the base configuration rotates about the front line causing the back to lift in a arc. 1. If the pin is secure in the base i.e. the tolerances are within 1 or 2mm then the pin will be lifted with the base so shortening the length in the ground , so reducing the resistance to over turning in wet/adverse soil conditions. 2. 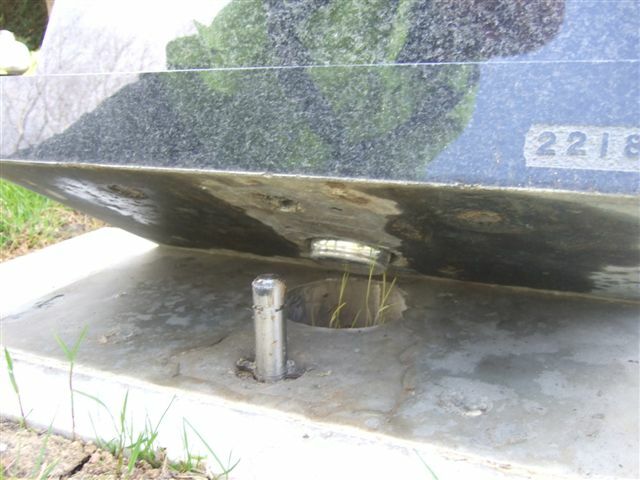 If the pin is sufficiently stable in the ground the base could lift off the pin if the cement joint breaks which often does, causing the headstone to topple. Meaning the pin not being attached to the memorial plays no part at all in stabilising the memorial. Stone Safe believe all testing of memorials (lawn) should be carried out from the back of the memorial being pushed forward.